Herein, an optical plasmonic chemosensor was fabricated via in situ embedding of stable copper nanoparticles (Cu NPs) within flexible nanocellulose film (ECNPs-NC film) utilized for optical sensing of cyanide (CN−). 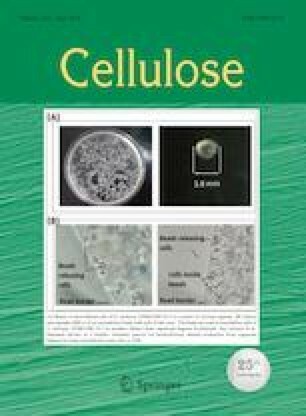 Glycerol, as a plasticizer, was added to the nanocellulose suspension to improve ductility of nanocellulose-based film. In addition, to enhance the stability of Cu NPs against oxidizing and corrosion, the fabricated ECNPs-NC film was immersed and coated by benzotriazole solution. The Cu NPs were stable for 4 months. The fabricated ECNPs-NC film was characterized by various methods such as field emission scanning electron microscopy, X-ray diffraction, X-ray photoelectron spectroscopic, dynamic light scattering, thermo-gravimetric analysis, and energy-dispersive X-ray spectroscopy. Analytical parameters influencing the efficiency of ECNPs-NC film fabrication were investigated and optimum conditions were stablished. The fabricated ECNPs-NC film was applied as a novel optical sensor for CN− detection in water samples. By changing in CN− concentration, surface plasmon resonance absorption intensity was changed and it was linear in the range of 0.25–0.40 µg mL−1 with a detection limit of 0.015 µg mL−1. The online version of this article ( https://doi.org/10.1007/s10570-019-02405-0) contains supplementary material, which is available to authorized users. The financial support from Yasuj University of Medical Sciences, Yasuj, Iran, is gratefully acknowledged.